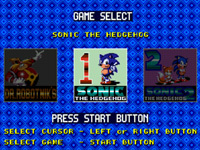 * This game was a Collection of Sonic 1, Sonic 2 and Dr Robotnik's Mean Bean Machine. Apart from the added Menu, they are Perfect Copies (down to Cheats). See Sections for Each Game for more information.